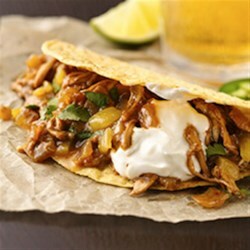 "Enjoy this Mexican-style dinner featured with chicken, beer, Old El Paso® taco shells and green chiles--a wonderful meal." In 12-inch skillet, heat oil over medium-high heat. Add onion and chicken; cook about 1 minute or until onion is tender. Stir in remaining sauce ingredients. Heat to boiling. Reduce heat to low; cook uncovered about 20 minutes, stirring occasionally. Wonton tacos for maximum crunch! We liked this! I didn't follow the recipe fully, I just sautéed some onion and added the chicken and put some green chiles, enchilada sauce, and cheap beer in and let it cook 20 minutes. Follow this recipe to the T-. Unfortunately was not fond of it. Will not be making again. I used a rotisserie chicken and it came out delicious. A tasty filling for flour tortillas or crispy shells. Next time, I will make sure to cook rice with it, as it would make a great taco bowl! This was very good. I accidentally put a bit too much beer in and it was a little runny but the taste was delicious. I will be making this again.